188 Bai Chay Street - Halong Bay ,Halong City Quang Ninh, Τουάν Τσάου Άιλαντ, Halong, Βιετνάμ, 200000. 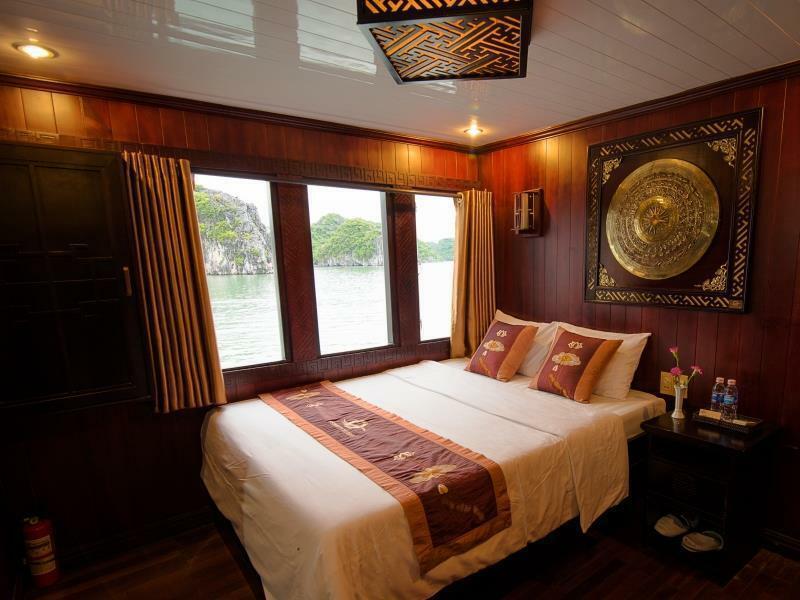 Σε πολύ καλή τοποθεσία της Halong, το Halong Apricot Cruise είναι μια πολύ καλή βάση απ'όπου μπορείτε να εξερευνήσετε την σφύζουσα πόλη. Το ξενοδοχείο βρίσκεται 2 Km από το κέντρο της πόλης και σας προσφέρει εύκολη πρόσβαση σε σημαντικά μέρη της. Από τη βολική της τοποθεσία, η ιδιοκτησία προσφέρει εύκολη πρόσβαση σε κορυφαίους προορισμούς της πόλης. Με τις υψηλού επιπέδου υπηρεσίες και την μεγάλη ποικιλία ανέσεων, το Halong Apricot Cruise δεσμεύεται ότι η διαμονή σας θα είναι όσο πιο άνετη γίνεται. Αυτό το ξενοδοχείο προσφέρει πολυάριθμες εγκαταστάσεις για να ικανοποιήσει ακόμα και τους πιο απαιτητικούς πελάτες του. Απολαύστε ανέσεις υψηλών προδιαγραφών κατά τη διαμονή σας. Ορισμένα δωμάτια περιλαμβάνουν κρεμάστρα ρούχων, δωρεάν καφές φίλτρου, δωρεάν τσάι, δωρεάν ποτό καλωσορίσματος, καθρέφτης - ό,τι πρέπει για να αναζωογονηθείτε μετά από μια γεμάτη μέρα. Το ξενοδοχείο προσφέρει μια άριστη ποικιλία ψυχαγωγικών εγκαταστάσεων, όπως τα πλοία, κανό, μονοπάτια για πεζοπορία, σνόρκελινγκ, ιδιωτική παραλία. 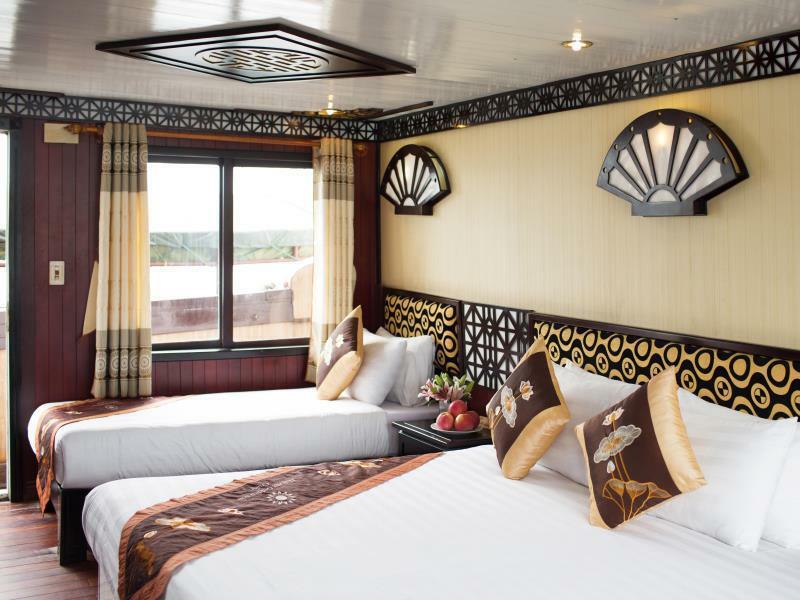 Το Halong Apricot Cruise είναι ο ένας και μοναδικός προορισμός για εσάς που ψάχνετε ποιοτικά καταλύματα στη Halong. Guests are required to pre-register with the cruise prior to arrival. The cruise requires the guest’s full name, date of birth, nationality, passport number, and visa expiry date. A valid passport or ID is required upon boarding. Children under 5 years old stay for free when sharing a room with parents. Children between 5 – 8 years will be charged 50% when sharing a room with parents. Children between 9-11 years old will be charged 75% when sharing a room with parents. 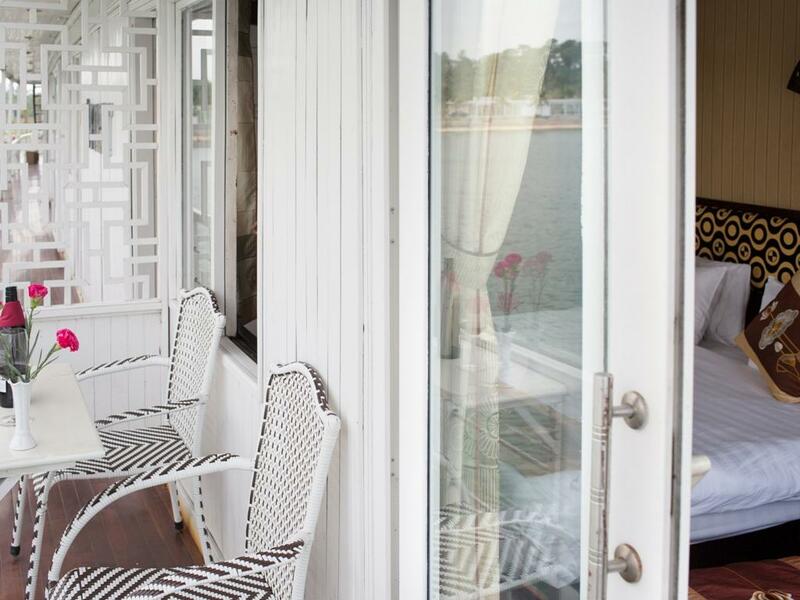 All inclusive packages will start at lunch time and will end after breakfast on the day of departure. 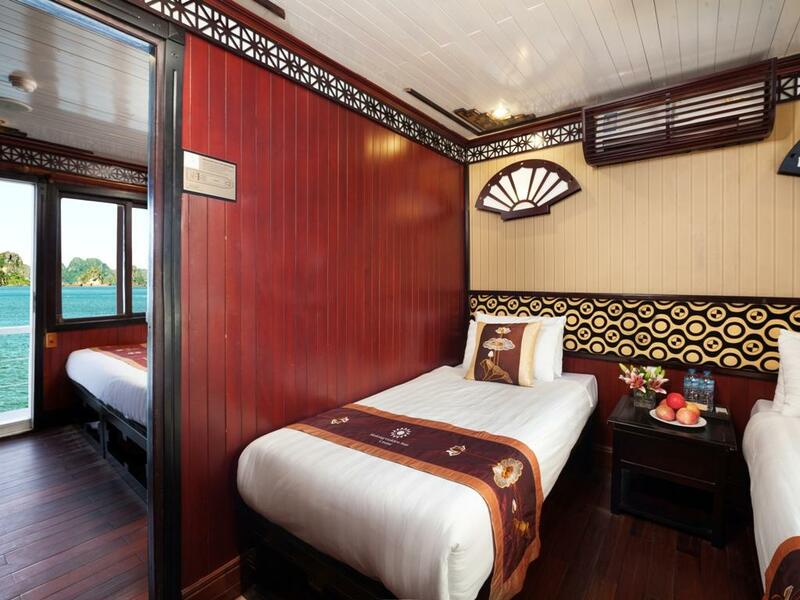 The package includes: shuttle bus service from Hanoi city center, welcome drinks, entrance and sightseeing fees, an English-speaking tour guide, a day boat to Lan Ha Bay, Deluxe cabins with air conditioning and en-suite bathrooms, Vietnamese and International breakfast, lunch, and dinner, kayaking, insurance, taxes and service charges. The shuttle bus service departs at 08:00 AM from Golden Sun’s office in Hanoi at 34/131 Hong Ha Road. The boat embarks at 12:00 PM at Tuan Chau Island, Halong. 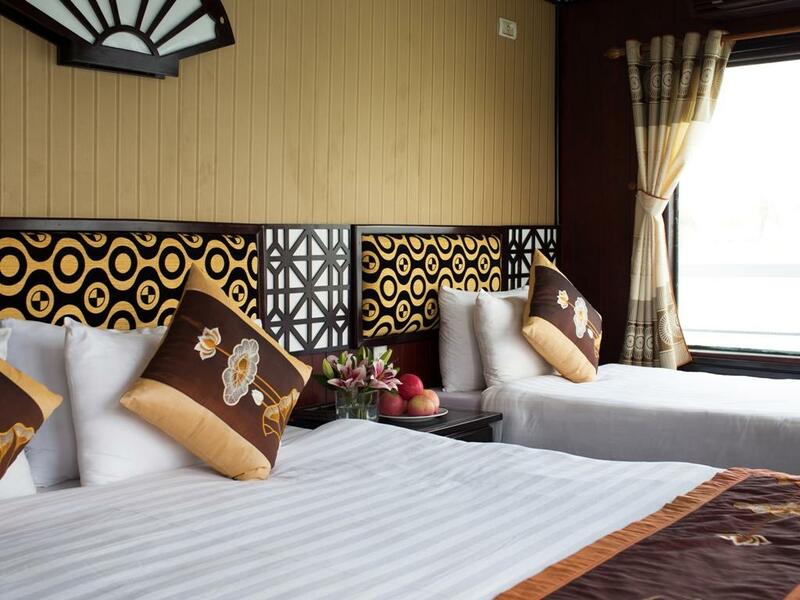 Guest are required to provide the hotel name, address and contact number in Hanoi or Halong at least 24 hours in advance for the pick-up service. The itinerary and programs are subject to change when necessary or due to weather conditions. Pro : Everything was great overall, tour guide provide clear information, food were nice and delicious. Con: The karaoke was mulfunction. Bingo was our guide for the 2 day/1 night cruise. He brought great energy to the group and made everything run smoothly. Breakfast was limited however, lunch and dinner were filling. 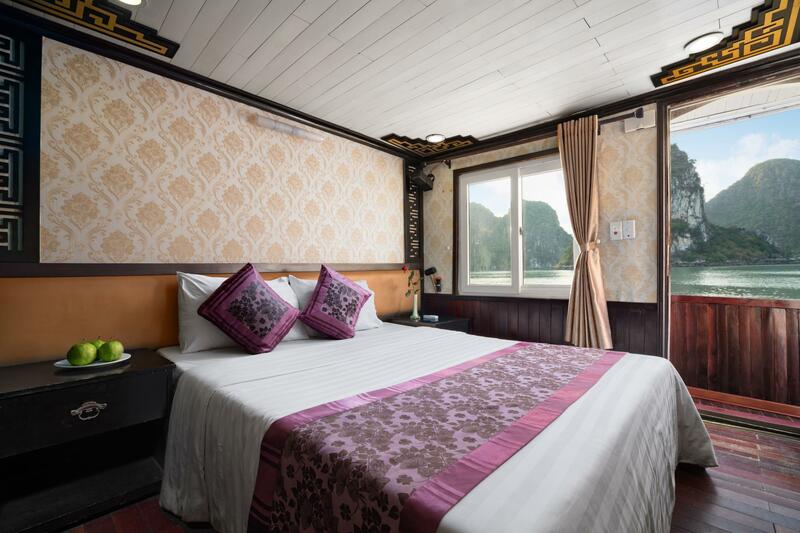 The cruise and cabins are abit old.. probably need some maintenance.. aircond and plugs sometimes are not functioning.. however.. the activities offered are good enough.. food is good too.. tour guide provided is good.. provide sufficient services.. Pick up from and return to hotel. Cruise ship is ok though a little old. Tour guide, Danny, is good really making effort to make every guest happy. Itinerary on board is good- trying to keep everybody occupied. One big minus is the food which can be better. Phòng cho phép trẻ em dưới 10 tuổi ở free (theo thông tin trên Agoda) nhưng nhân viên yêu cầu nâng cấp phòng và đóng thêm tiền. Khá thất vọng với sự thiếu chuyên nghiệp này, tuy nhiên Agoda hứa bù lại khoản tiền nâng cấp phòng. Số tiền nâng cấp không nhiều nhưng gây ra sự khó chịu khá lớn vì cảm giác thiếu tôn trọng khách hàng cho dù không làm gì sai. Chất lượng tàu, phòng ốc và bữa ăn tạm ổn so với giá dịch vụ tàu khách nói chung khác(tại Hạ Long), tất nhiên không thể so sánh với các khách sạn tương đương trên cạn khác hoặc tại các điểm du lịch khác. Nhân viên thân thiện.